Complete the form below to get the downloadable/printable checklist. Now that winter is coming to a close, it’s time for spring cleaning. 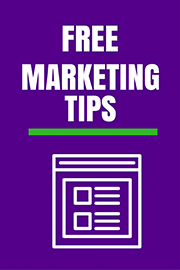 Here’s what you can do in the marketing area to keep things fresh and consistent. Review your goals. How are the marketing efforts you’ve been doing helping you to attain the firm’s goals? Have you checked recently? A monthly update is best, but quarterly is good too. Now is a good time to revisit those efforts and determine successes, failures, and areas for adjustment. Is it time for something new? If efforts you’ve liked in the past just don’t “fit” any longer, it’s time for a new effort. Sometimes you have to get rid of the good to find the great. Go shopping! If your marketing efforts feel a little stale, it might be time to shop around for marketers with fresh ideas, graphic designers with a new perspective, or vendors with better pricing advantages. Sharpen your pencils and create some new content. Develop a spring and summer content strategy that you can leverage the rest of the year. Start with five to ten topics you can quickly write about (e.g., “Top 3 Advantages of [fill in the blank]” or “5 Ways Small [industry] Companies Can Save on Taxes”). Then post them on your website over the next several weeks. You can future date most blogs to release on the same date each month. Voila, content through fall. Stop trying to be everywhere on social media. Focus on one or two platforms, where your target market is, and form a strategic plan to reach new leads through those channels. Consider adding a paid promotion element to your efforts to increase exposure in niche markets. This can be done with sponsored Tweets, Facebook and LinkedIn posts. Google and Bing AdWords are also a great tool. Now that you have the cleaning supplies you need, what will you tackle this spring? 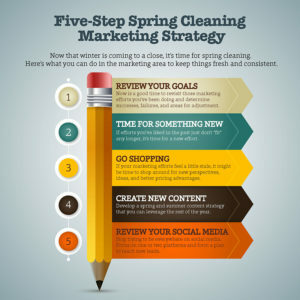 Download the 5-Step Spring-Cleaning Marketing Strategy checklist today! Also available via video on our YouTube channel. Disclaimer: This post originally appeared in the CPA Client Bulletin Resource Guide, © 2017, AICPA. Reprinted by permission.